Summer break is in full swing for our little family, and while we don't have major vacation plans, we're making a big effort to focus on family time. One of our favorite things to do as a family is to spend time in the pool. My husband grew up spending summers at the pool of a family member and has always loved the water. It's no big surprise that our kids are little fishies and are also drawn to the water. 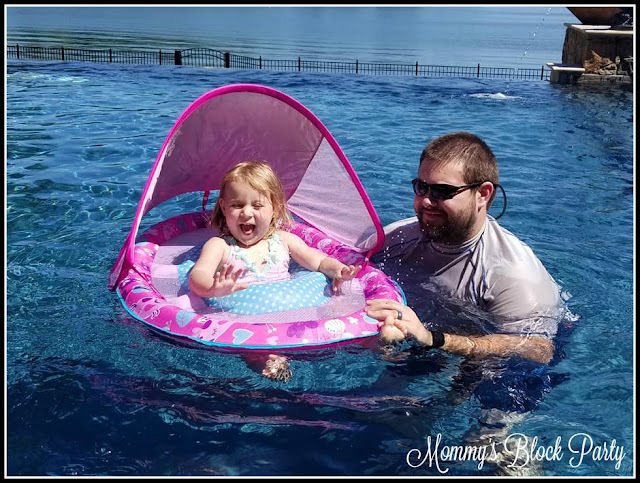 As much as I enjoy swimming and being in the pool, I tend to err on the side of caution when it comes to my kids being in or around a pool. When I was a small child, I had a scary experience when a family member took me down a water slide at my uncle's pool, before I learned to swim. Though they promised not to let me go, it was probably unavoidable, and when we hit the water, we were instantly separated. I remember gasping for air, and somehow, I managed to get myself to the side of the pool to call for help. Since my near-drowning incident as a child, I have taught myself how to swim, and have had a very healthy respect for all bodies of water. 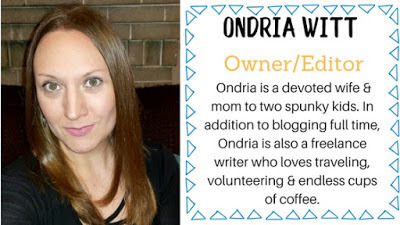 When my husband and I became parents, I was naturally nervous about them being in the pool and spent a lot of time researching pool safety and the best pool floats for babies and toddlers. Safe water play makes the whole family feel at ease. We've been turning to SwimWays to keep our kids safe in the pool since they were old enough to first experience the water. Our oldest child (7 years) started out testing the waters with SwimWays products when he was just a little fish. Now, he's a big fish, and has taken swim classes, and is very comfortable, though always careful and cautious in the water. He's even expressed interest in joining a local swim team. Baby S just turned 2 years old, so she is in that fun 'let's explore everything' phase of toddlerhood. She's pretty fearless and gives us a run for our money nearly every day (this is why my hair is suddenly turning slivery-grey!). 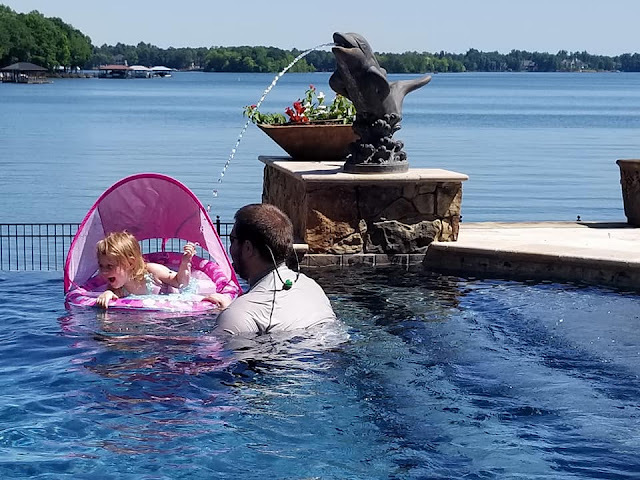 S likes to have a bit of freedom in the pool, which is why the SwimWays Baby Spring Float Sun Canopy is the perfect choice for her- and us. We introduced both of our kids to the pool in SwimWays floats. 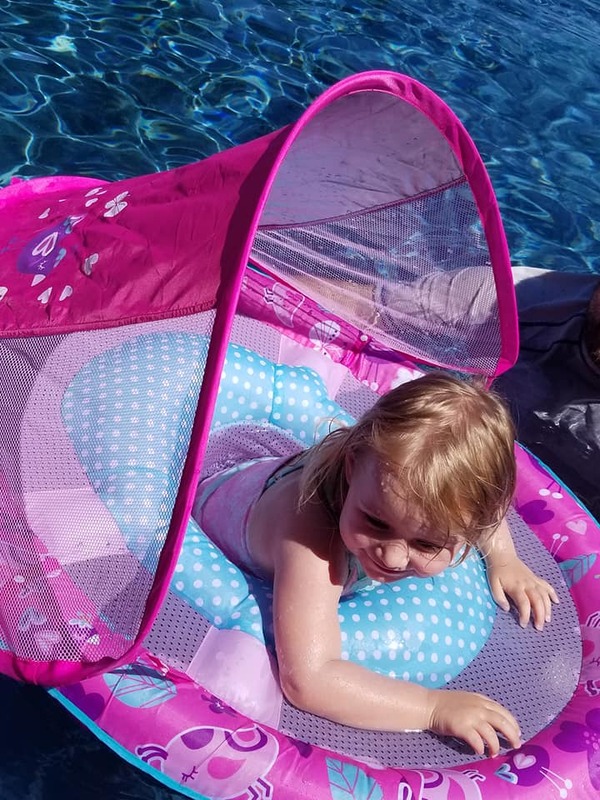 There are a lot of reasons to love the SwimWays Baby Spring Float Sun Canopy. It's the perfect way to give your little fish a taste of what it's like to 'swim' in the pool, or to help teach them how to swim. The float is so easy to take along to the pool. It comes in easy to carry packaging, with a shoulder strap. It takes just a couple of minutes to inflate the float, and attach the optional sun canopy with added 50+ UPF sun protection. The float has a large circumference with added stability, thanks to the patented inner spring. The mesh seat keeps your little one safe and comfortable. The inflated areas of the float are fabric-covered in an adorable printed design. The safety valves and dual air chambers of the float enhance overall security. An added mesh play area gives your little fish extra room to splash and play- perfect for pool toys. Safe, comfy & fully protected, thanks to SwimWays! Our girl loves her SwimWays pool float. We store it on our back porch at home, and when it's not in use, she squeals with delight when she sees it, asking to go in her float and go swimming. So cute! 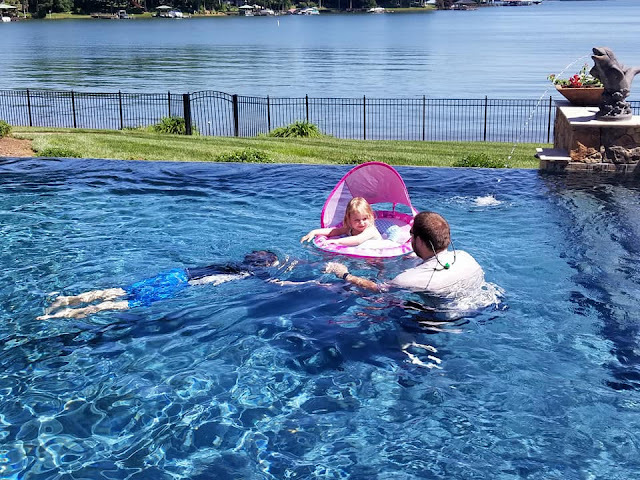 S is just about ready to start taking swim lessons with a certified instructor, and we're so glad that we've been able to help her feel safe and comfortable in the pool, thanks to SwimWays. The float has helped her get used to being in an upright position in the pool, and gives her a chance to kick her legs under the water. When she's out of the float, being held onto by myself or my husband, she has a natural instinct to kick, paddle her arms, and hold her head up... a great place to start. My little fish love to swim! I am so happy that my kids love the water, and want to be safe in and around the pool. Our oldest respects pool rules, and knows the dangers of pools, as well. He's setting a wonderful example for his baby sister, and is a great encourager for her, as well. My husband and I feel strongly about our kids knowing how to swim at a young age. My childhood pool incident kept me from learning to swim until much later in my life, and I don't want my kids to be afraid of the water. Teaching kids to swim when they're young is an excellent idea. In fact, SwimWays is dedicated to helping families have a safe summer by advocating that kids learn to swim, and by offering the very best in safe pool floats and products. The Baby Spring Float Sun Canopy for babies 9-24 months is the #1 selling baby float in the U.S. It consistently receives 4 & 5-star ratings by consumers, which comes as no surprise. Make sure your family is safe in the pool this summer! You can find the SwimWays Baby Spring Float Sun Canopy at Target. Connect with SwimWays on Facebook, Twitter, Pinterest, and IG. 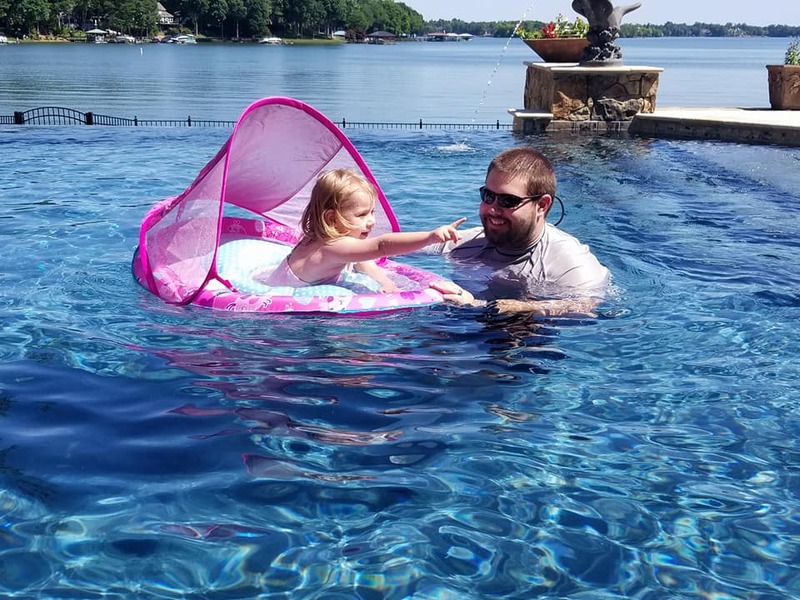 Special thanks to SwimWays for keeping my family safe this summer! This is so cool! My daughter is almost 4 and she's a strong swimmer (thanks to early swim lessons!) but I definitely need to look into getting one of these when we have our next baby. You have a beautiful pool (side comment). However, back to your post...I am really hoping to get my infant into swimming lessons. Before reading this post, I had little faith in devices or products that like the ones featured here, but I am considering them now based on your experience. You get it, the goal is to keep our babies safe. Thanks! We have one of these swim floats for our 1 year old and love it! It means that everyone can feel a little more relaxed when we're enjoying the pool. I definitely plan on swimming lessons for my 4 year old this summer.